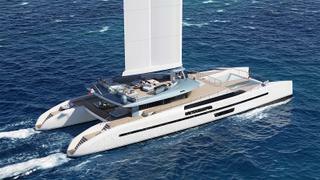 French studio VPLP Design has released its latest yacht concept, a 47.55 metre wingsail catamaran called Evidence. Using similar technology to that which propelled the America’s Cup racing boats during the last two campaigns, Evidence only requires a relatively small sailplan for her length of 400 square metres. Accommodation is for up to 12 guests split between six staterooms, including a main-deck owner’s cabin that measures 46.5 square metres. A double and a twin cabin are also located on the main deck, while two further twins and another double on the lower deck complete the guest layout. The crew quarters would be situated entirely in the starboard hull and would allow for a staff of up to ten people. Vital statistics include a 16.6 metre beam and a maximum draught of three metres. Out on deck, Evidence offers plenty of options for relaxing and soaking up the sun, with a private owner’s cockpit near the bow, upper deck sunpads and a vast superyacht sundeck, complete with glass-bottomed spa pool. Meanwhile, extensive storage space allows Evidence to carry two tenders, Seabobs and a full set of Scuba diving gear. 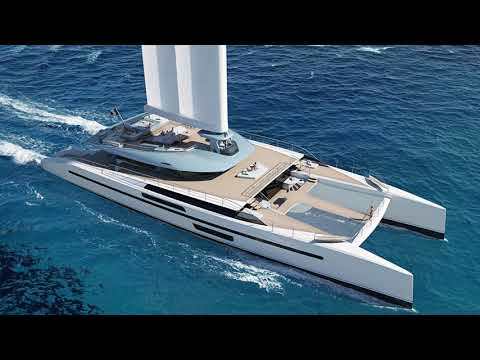 Auxiliary power would come from a pair of 490hp Caterpillar C12 diesel engines that propel this multihull superyacht to a top speed of 16 knots and offer comfortable cruising at 14 knots.